Total Basement Finishing is excited to announce a remodeling solution for garages using durable, mold-resistant EverLast wall panels. 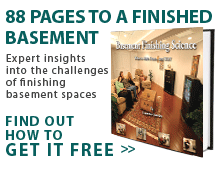 Total Basement Finishing, an innovator and installer of basement finishing and remodeling products, is announcing a brand new application of its top-selling EverLast Wall Panels and add-on products. EverLast Garage uses the same mold, mildew and dent-resistant wall panels as the Total Basement Finishing System and offers an innovative finishing solution for garages. ”What a difference for a space you see every single day as you come and go from your home,” said Jeff Nelson, Vice President of Total Basement Finishing, surveying a garage recently transformed with EverLast Garage. Traditional building materials like drywall and wood studs provide food sources for mold to thrive and can be easily dented. EverLast Wall Panels and Total Basement Finishing's entire lineup of products were designed to overcome these challenges. With more than a million feet of EverLast Wall Panels installed in basements, Total Basement Finishing continues its commitment to bringing quality, durable, remodeling products to homeowners. EverLast Garage is available from more than 50 authorized dealers nationwide and in Canada.